I seem to be going through a sort of transition these days with my rheuma-dragon, that evil old beastie. Although the symptoms he causes have been frequently annoying over the last three or four years, and his grouchy, persistent cousin the bursitis-wyrm has had his sandpaper claws sunk into my hips for the last two, both of them have ratcheted things up during the last six months—and pushed them even higher in the last two weeks. Yesterday, I endured the highest level of pain I’ve had yet since my 6-year RA remission ended in 2007. A good portion of the flare was in my hips, as usual, caused by the rheuma-related bursitis. But there was a more profound ache within it, centered deeper inside the hip than those small bursal sacs that lay between the ball-and-socket joints and the tendon-secured muscles that run down the sides of the hips to the knee. The worst pain felt like it was inside the joint, inside the bones themselves. If you have RA, you know the sensation—it’s deep, hot, malignant, throbbing and insistent. It’s impossible to ignore. When it’s really bad, it can make moving desperately painful. At times, any pressure on or movement of the affected joint is simply unendurable. The ache in my hands intensified considerably yesterday, too. No bursitis to blame, there. The pain was pure RA, its dull knives concentrated in the large knuckles of both hands and radiating toward my wrists and fingertips. And even as ugly and painful as it was yesterday, this flare was a mere shadow of the flares I used to get in the first decade following my diagnosis in the late 80s. Those were Flares with a capitol F. They were Red-Letter Flares. They were memorable. And I do remember them—well—which I’m sure is part of my problem today. Yes, some of it is “in my head,” unfortunately. Pain as intense as I experienced yesterday raises a sort of creeping, anticipatory dread in the back of my mind. It’s like a black mist that permeates everything in my world. It was because of this insidious fear of once again experiencing that old agony that I sought out a rheumatologist when it became clear that the nasty rheauma-dragon was waking up again after his long hibernation. When it was clear that he was more than a little hungry—he was friggin’ ravenous. I knew I needed help. My previous experience with RA drugs had been mostly limited to a profoundly ineffective spectrum of NSAIDs (Non-Steroidal-Anti-Inflammatory Drugs), most of which irritated my stomach to the point that I’d dread the awful, sick nausea each dose brought with it. They were Aspirin. Naproxin. Naprosin. And Etc. I finally stopped taking them entirely and turned my back on any further medical intervention. I was that disillusioned, convinced that the busy doctors and their drugs could do nothing for my RA because, frankly, after five years of trying, they hadn’t. 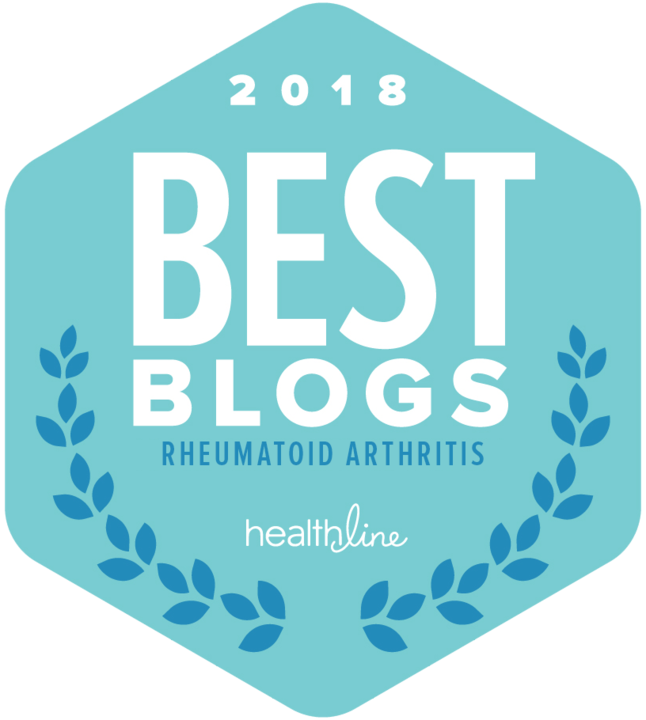 But over the later, remission years I read here and there about the new Disease Modifying Anti-Rheumatic Drugs (DMARDs) for rheumatoid arthritis. When my dragon finally woke again, I was so scared I was willing to try them. I’d heard of the seemingly miraculous Biologics, too. I wanted them all in my arsenal even though I had little hope that they could actually do any good. And here I am today, roughly three years after consulting with a Veteran’s Administration MD about my RA. I have a terrific VA rheumatologist on my side—and an impressive array of pills. (Their collected bottles inspire a sort of awe in my family. Frankly, I’m awed, too.) I take three different DMARDs. No NSAIDs. I take vitamins and supplements like folic acid. And I have running prescriptions for two separate pain meds, one of them a narcotic. I keep those particular big guns stashed away in a high, dark cupboard. They’re my puny refuge when days like yesterday hit. Because my daily medicinal cocktail has, until now, kept my RA dragon slow and sleepy and his knife-like teeth blunted, my faith in medical science has been mostly restored. And while I’m aware that alternative therapies, from copper bracelets to herbals and no-nightshade-plants diets to acupuncture and massage, are available, they’ve never worked for me with any surety. (Believe me, like most people with chronic pain and disability, I’ve tried them. I’d never discourage anyone else from trying them, either, since such things work in such an individualized way on this demented disease.) At this time in my life, I’m relying on medical science and the pharmaceutical companies. I’m convinced that the drugs they’re providing are keeping the worst symptoms and effects of my RA at bay, even though there are a few serious flaws in the armor. Nevertheless, yesterday’s serious pain in my hands and hips (and briefly, both knees) was a heads-up. Over the last six months I’ve relaxed and let my weight creep back up, allowing yummy but less-than-nutritious foods back into my diet in less-than-healthy quantities. Part of that I wish I could blame on my mom’s menu preferences, but really, I don’t have to eat jelly beans, chocolate candy and cookies with her. I don’t have to eat fast-food burgers and fries or frozen lasagnas. (She can, does and always has eaten all of those things with abandon without gaining any weight or exhibiting any other noticeable side-effects. Grrrr…) The hard truth is that I know how to eat mindfully—I just have to do it. It’s a challenge, keeping things in balance with this disease and the other conditions it spawns over time. And it’s one that will never really end, so part of being successful in meeting that challenge has to be accepting it. I’m working on it, trying hard to keep the dread away. I guess that’s all any of us can do. I’m so sorry to hear that the RA Dragon is flaming through your life with such intensity. Your descriptions of the pain are spot on, and I am very new to this world. Here’s hoping the rheumatologist can sort things out. Your pain is an alarm bell. I hope s/he is listening carefully. I hate that you are having such a rough go of it Wren. I agree that your descriptions are just so right. I am so glad that you are able; despite this horrible, bone-deep pain, to keep your head up and move forward. I am right there with you with eating “right” and getting exercise- I feel it’s the first thing we let go when we are not feeling well. I don’t know how anyone keeps up a busy life, nutrition and exercise when their body is actively rebelling- but if anyone can do it, you can. I wish I could wave my magic dragon-blaster wand and banish that old dragon for you. I guess your rheumatologist and your drugs will have to work that magic. I know the hip pain you describe. It’s that deep down bursitis that feels like every ounce of weight you put on that leg is killing your hip. I learned the hard way that when RA starts eating your hip joint, it does hurt in the groin, not the outside. That doesn’t make it hurt any less, but at least you can identify what’s going on. Unfortunately for me, the hip bursitis was the precursor to my eventual hip replacement. Hope things calm down and that your mom continues to do well. I am so sorry that your RA and bursitis have reared their ugly heads in the most brutal way. I know exactly what you mean by that deep, hot, throbbing and insistent pain and as I read those words, I could feel exactly that. Funny, how all we, RAers, get each other. Even if there is no joint damage, the inflammation is there, no doubt. 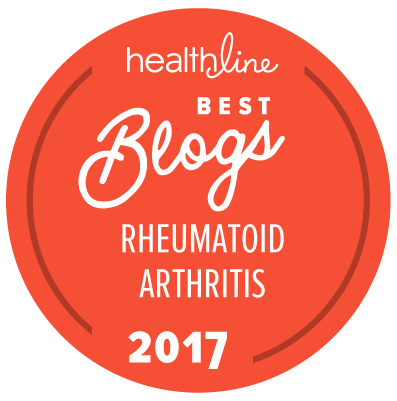 I know the hand pain too – even when my RA symptoms are mild – my hands are always hurting and they seem to scream out the most. All someone has to do is touch my knuckles and it is the most unimaginable pain. I know you are taking DMARDs but have your considered biologic agents like Humira. For me, it is the combination between methotrexate and Humira that has been a Godsend. I cannot imagine discontinuing my meds – it is a scary thought because I don’t want things to go back to the way they were when my RA was at its worst. You are right that the flare up is just a temporary setback. Once you bounce back, it is back to the gym. Feel better soon. You’re right too about the “learned” element of pain – if you expect it to hurt, it often does and post-op, for example, effective pain relief is particularly important so the patient is willing to mobilise. Out of interest – has anybody found a way of using a mouse that doesn’t make your wrist ache? I don’t have RA, just PMR, but the base of my right thumb and the next 2 fingers are driving me mad by unremitting discomfort/pain at a low level. This morning it’s mainly a change in the weather so it’s worse then usual but it will improve when the sun comes back – for which I’m eternally grateful. Wouldn’t change places with you guys for anything. It is with great sadness that I read your post, so sorry that you are going through this right now. My hips have been giving me fits the last few months also, I’m fearing the worst. I know the pain you speak of, it is indeed impossible to ignore. I hope you find some relief soon.